Are you looking for a routing number or an account number? For your security, we don't display account numbers here. 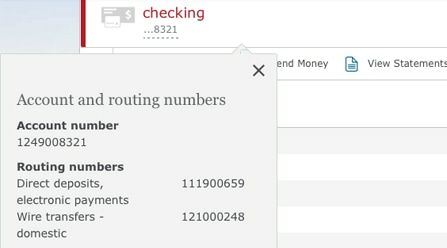 See below for help locating your account and routing numbers. Your account number is located at the top of your online or paper statement. Your account number is located along the bottom of your check, to the right of the routing number and to the left of the check number. Will you be using this information to receive a wire transfer? Where is the source of the incoming wire transfer? For what account type do you need this information? In what state did you open your ? Don't know your account number? Call us at 1-800-869-3557, 24 hours a day, 7 days a week. Existing IRA customers, please call 1-877-823-7782 for Direct Deposit instructions. Note for California customers: If you opened your account in Southern California, you may see a different routing number on your checks than the number displayed above. You can use either number. Note for California customers: If your account has check-writing capabilities and you opened the account in Southern California, you may see a different routing number on your checks than the number displayed above. You can use either number. A SWIFT code is used instead of a routing number for international wire transfers.